This book celebrates the American Indian belief that the cycle of Creation is taking place around us at all times. 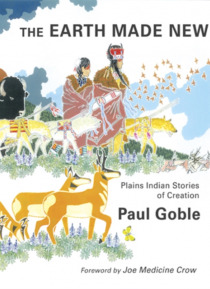 In this beautifully illustrated edition, replete with stunning watercolors, Goble tells the remarkable Plains Indian story of the remaking of Earth after the flood, when the creatures who survived in the water cried out to God, their Creator, "e;Earth Maker! Earth Maker! We want t… o live! "e; Earth Maker heard their cries and told them, "e;I will help you"e;. Earth Maker created birds and horses of every color and hid giant monsters in the rivers. Amazingly, Earth Maker asked for help from various creatures and received aid from Grandmother Turtle, who carried the Earth on her back, and the little black Coot bird. When making Man and Woman, Earth Maker laid them to dry under leaves. "e;Each morning he raised the leaves a little and peeped underneath. On the Fourth day Earth Maker told the figures to get up"e; and said, "e;I am your Father and Grandfather and the Earth is your Mother and Grandmother.... I will always be close to you. "e; Weaving together the legends and myths of the Plains Indian tribes, including the stories of the Cheyenne, Blackfoot, Arapaho, and the Crow, this creation story also reveals the making of the buffaloes, mountains, plains, and plants, as well as Thunderbirds "e;with lightning in the blink of their eyes"e;.